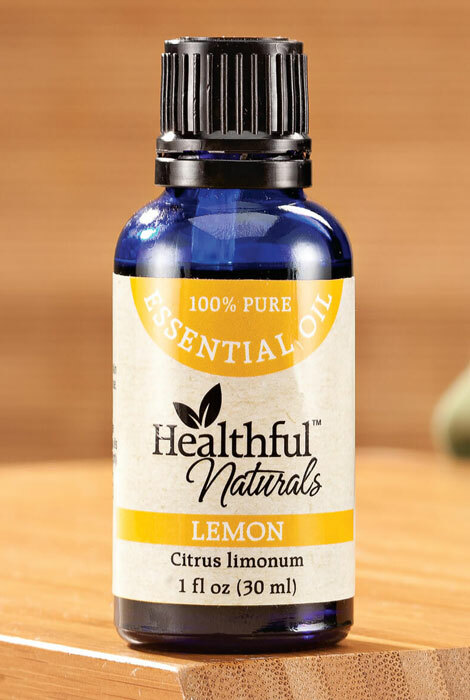 Our Healthful™ Naturals lemon essential oil lives up to the name “essential”—with refreshing, cleansing and tonifying properties, energizing scent and endless uses! Extracted in the USA, our lemon oil comes from cold-pressing the lemon peel, the most nutrient dense portion of the lemon. Featuring a fresh, citrus scent, this top note oil blends well with lavender, rosemary and ylang ylang. Used in aromatherapy (diluted in water in a diffuser) its purifying, uplifting properties may aid digestion and respiratory comfort while supporting cognitive energy and focus. Lemon oil’s natural anti-microbial properties help safely clean and degrease home surfaces, freshen laundry and purify the air. It is not intended for internal use. Complete with orifice reducer cap for slow drop delivery, the generous 30ml (1 oz.) bottle includes approximately 500 drops ... making our 100% pure essential oil an outstanding value. For topical use, dilute in a carrier oil such as jojoba, coconut or olive oil first.